A hug can mean a million things. The list expanded to a million and one on Sunday when North Carolina coach Roy Williams embraced Iowa State coach Fred Hoiberg signaling the end of the game with the Cyclones of Iowa State advancing to the Sweet 16. The hug told the whole arena and the viewers at home the game was over, not the time running out because the NCAA apparently can’t hire anyone who has ever run a clock before. The clock ran out on North Carolina Sunday, but the advancement of the Cyclones might have again started the clock on their own coach. A year ago, Fred Hoiberg’s name was quite popular around the state of Minnesota with rumors and hopes of him being Tubby Smith’s replacement at the University of Minnesota. I’m sure that The Mayor’s name will be highlighted once Iowa State’s tournament run ends, but with a different basketball squad in Minneapolis. It’s more than likely that Rick Adelman will not be coming back as the Minnesota Timberwolves head coach next season. Adelman will be 68 when training camp opens which will follow a third failed attempt at making the playoffs despite having a remarkable Kevin Love healthy for the duration of the season. This leaves a vacant coaching spot on an NBA team that should be in the playoffs given the right circumstances. Hoiberg will be offered the job. It simply makes no sense not to offer him the job and the Timberwolves would be doing themselves an injustice by not asking the former Wolves player and exec, but Hoiberg needs to stay in Ames. He’s The Mayor for crying out loud. For those of you that aren’t familiar with Hoiberg, here’s a quick rundown: really good quarterback at Ames High School and turned down the University of Nebraska’s offer of a football scholarship, won the Iowa state high school basketball championship as a senior and was named Iowa’s Mr. Basketball, played basketball at Iowa State and was beloved, played ten years in the NBA but forced to retire due to a heart condition, worked in the front office of the Timberwolves and now is sitting in the Sweet 16 as head coach in his return to Iowa State amidst their third straight NCAA Tournament appearance. The Mayor is loved in Ames and there’s just no denying that, but he’s also very loved in Minnesota where he was a big part of the last Timberwolves teams that were actually worth a damn. Minnesotans love him so much we really wanted him to be the Gophers coach, but nothing makes the Gopher job better to him than his hometown/alma mater Iowa State. The same should apply for the Timberwolves. I beg Fred Hoiberg to stay in Ames and coach the Iowa State Cyclones until he can’t coach anymore. 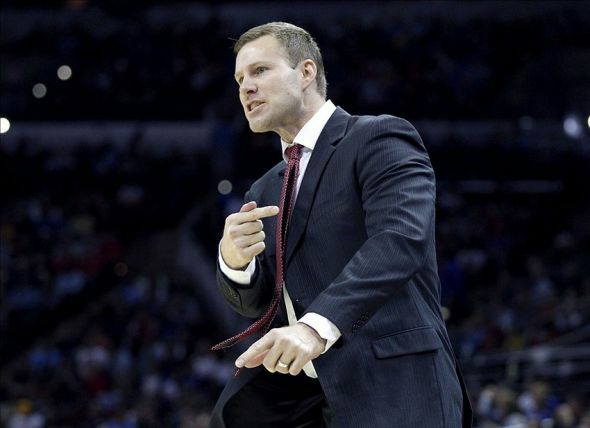 There’s something special in being loyal to one team and I believe Fred Hoiberg can be that guy. He’ll never be fired by Iowa State, he’ll have the job as long as he wants and I hope that is a long time. Loyalty to one team rarely happens anymore, but rarely does one’s town reflect such loyalty back on someone the way it appears that Ames, Iowa does onto its unofficial Mayor in Hoiberg. The Mayor is going to get a lot of calls trying to move him into a bigger pond, but sometimes greatness comes in small packages, kind of like a hug.